With great tone and build quality, this amp is at the top of its class. It's got a sweat-inducing price tag, but remember - great things do come in small packages. Awesome rock tones. Exceptional build quality. Easy portability. The exchange rate makes it very expensive. The trend for lower-powered, smaller-sized amps is continuing unabated as more and more players admit, sometimes reluctantly, that their 50- and 100-watt valve beasts are more than they really need. 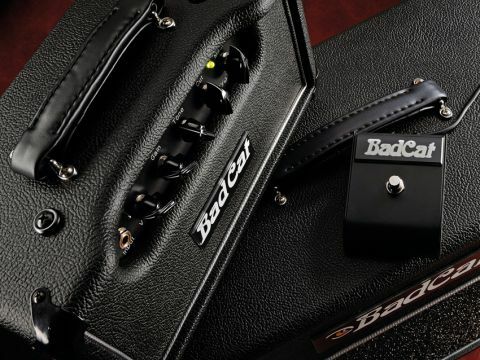 Thus, earlier this year a brand new product from one of America's most highly respected boutique builders really caught our eye, the Bad Cat Lil' 15. This two-channel, dual-EL84 mini-monster is so tiny you'd think that squeezing your sandwiches into the overgrown lunchbox of a cabinet would be a struggle, let alone employing the same quality, hand-wound transformers and point-to-point wiring as seen in the other high-end Bad Cat amps. "It started out as a suggestion by one of our artists, Ray Parker Jr," explains Bad Cat's 'Main Cat' James Heidrich. "He wanted me to build a 15-watt head that could be taken in his luggage or in the overhead of a plane. So one evening, I took one of our mini chassis and a set of 15-watt transformers, just to see if they'd fit together." Surprisingly they did fit, but would that chassis fit into Bad Cat's mini head cabinet? "There was just enough room and when we were wiring the chassis, I noticed I had some more space," he continues. "How much more could I incorporate into the chassis? A lot. And so the Lil' 15 was born." "This is a wonderful sounding amplifier that at times beggars belief with its stellar overdrive and sweet, clean rock tones." The first channel has a lower-gain 12AX7 preamp, which should make for those sweet cleans we've come to expect from Bad Cat. Meanwhile, channel two should offer a wildly different flavour: expect a hotter, fiercer gain structure courtesy of an EF86 that, according to Heidrich at least, "everyone loves". The EQ section is pretty straightforward: channel one is effectively your clean channel and has only volume and cut controls. Cut acts as more of a presence control and is backward in operation: instead of low to high, it adjusts counter-clockwise high to low. Channel two has a five-position tone switch that enables you to select pre-set Bad Cat tone shapes at the flick of a switch - this EQ option definitely saves chassis and front panel space. Channel two also has a master volume and gain control, while completing the front panel is a channel A/B mini switch and a two-colour LED: green for clean and red for mean. At the rear of the chassis is a non-speaker emulated line out. The body, drive and headroom of channel two is truly astonishing, offering a lush southern-rock tone that has a present top-end and sizzling overdrive - think Rich Robinson of The Black Crowes. More gain and more low-end will serve up a healthy dose of David Grissom, who himself is a Bat Cat endorsee. Here, this tonality sparkles with thick lows and punchy mids; great all round rock sounds that work well with Les Paul and Tele-style guitars; any decent classic guitar for that matter. Loading on near full gain through an old Marshall cabinet gives you a ferocious, muddy high-gain that's close to heavy Mastodon-style riffing, especially when using high-output humbuckers. Its 15-watts of power are mightily deceptive, as is channel one, which at moderate volumes offers typical Bad Cat qualities: tight, sweet cleans with the nice feel of headroom. Push the volume past the 12 o'clock point, however, and you're on the highway to hell. Here we have an open, straight up classic rock sound that's as much crisp and biting as it is thick and ballsy. Balancing the two channels can prove to be a little tricky, but stick with it and you'll be rewarded with two voices that cover most rock 'n' roll bases. This amp is for anyone who wants a top-quality, low wattage, portable live or recording amp. Although the current weakness of the pound against the American dollar means the Bad Cat Lil' 15 is expensive, it's not alone in that regard. However, there's no getting away from the fact that this is a wonderful sounding amplifier that at times beggars belief with its stellar overdrive and sweet, clean rock tones.